Question: What is the Pre-Registration Activity Guide? Why do I have to complete it? Answer: Prior to each semester’s enrollment, a Pre-Registration Activity Guide will appear in your Student Center. It contains emergency contact information, as well as the Financial Responsibility Agreement (FRA); both of which are required to be completed each semester. The FRA is a promise to take financial responsibility for payment of your student account. Your Activity Guide can be found in your To Do List within the LionPATH Student Center. For more information on how to complete the Pre-Registration Activity Guide, please view the video tutorial or read the step-by-step instructions. Question: Where can I find my enrollment date in LionPATH? 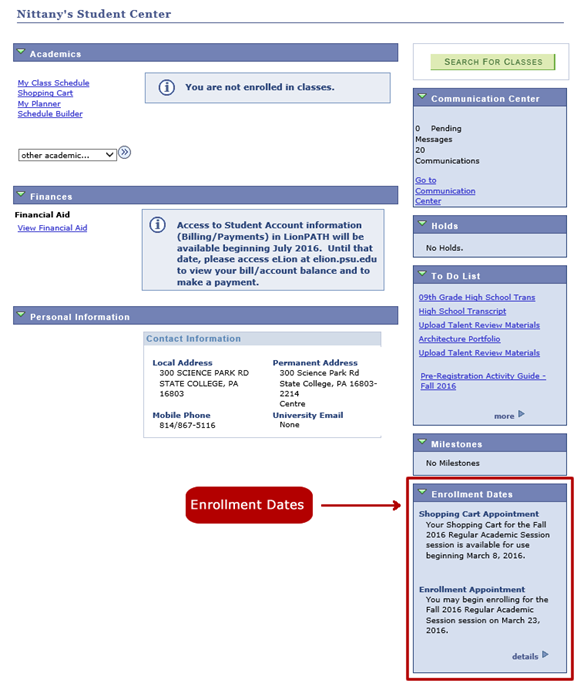 Answer: Your enrollment date is listed along the right column within the Student Center under the heading of “Enrollment Dates.” This is the first day you are eligible to enroll in courses for the corresponding semester. Question: How do I search for courses in LionPATH? 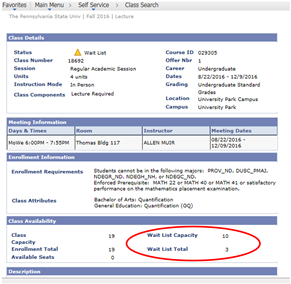 Answer: You can search for classes by clicking on the “Search for Classes” button in the top right-hand corner of the Student Center. 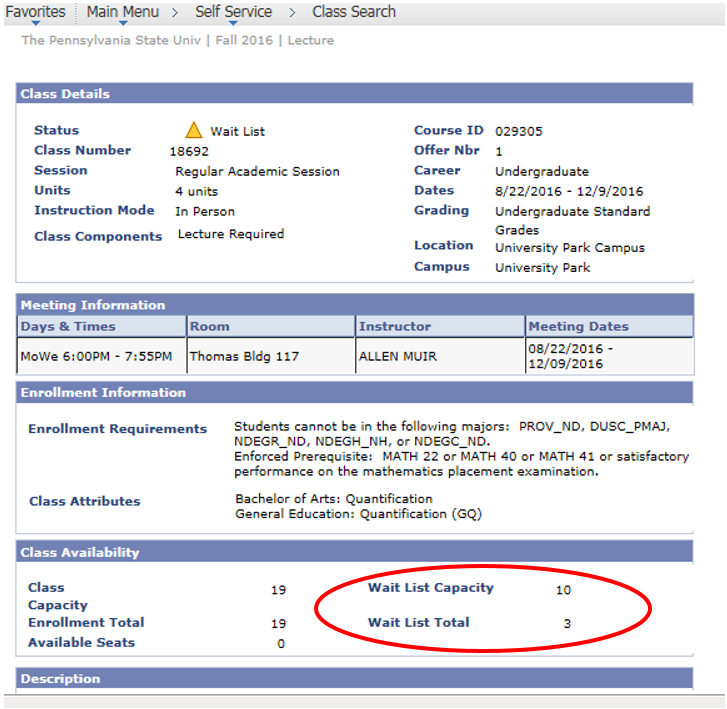 On the next screen, use the dropdowns to enter your search criteria (e.g., campus, subject, level, etc.) to narrow down your results. For more information on how to use the Class Search, please view the video tutorial or read the step-by-step instructions. For more information on how to use the Schedule Builder, please read the step-by-step instructions. Question: What is Schedule Builder? Answer: Schedule Builder is a new tool that allows you to conduct a class search, examine course offerings and plan course schedules. With Schedule Builder you can select the courses you want to take, add scheduled breaks, let the system generate possible schedules, view schedule combinations and choose the ones you like best, and send your preferred schedule to the "shopping cart" to expedite enrollment when you are eligible to enroll in classes. For more information on how to use Schedule Builder, please visit the LionPATH Support website. Question: How can I see General Education requirements for courses? Where are the course suffixes? Answer: Many of the familiar course number suffixes from eLion have been replaced by a course attribute. For instance, courses with an ‘H’ suffix now have an Honors course attribute. The ‘W’ suffix has been replaced by a writing across the curriculum course attribute. Courses that have suffixes like ‘A’, ‘B’ or ‘C’ may still remain. 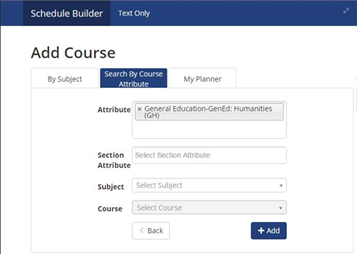 For more information on how to search for course attributes in Schedule Builder, please view the video tutorial or read the step-by-step instructions. For more information on how search for course attributes in the Class Search, please view the video tutorial or read the step-by-step instructions. Question: Where is my degree audit in LionPATH? Answer: Degree audits will not be available to students in LionPATH until later in fall 2016. This means that you still need to access your degree audits in eLion to view your degree requirements. As always, students are advised to meet with their adviser to review degree requirements before registering for courses. Question: What is the shopping cart? For more information on how to use the shopping cart, please view the video tutorial or read the step-by-step instructions. Question: Why do I need to validate the courses in my shopping cart? Answer: It is recommended that you validate the courses in your shopping cart before your enrollment date. Validating checks if you can enroll in your selected courses or if there is a potential problem such as a time conflict, prerequisite requirement, course control, etc. Validating will give you the opportunity to correct any course selection errors before your enrollment appointment. Question: What is a Class Swap? Answer: Swapping a class provides a way for you to drop a class you are currently enrolled in and replace it with a new class. Since this process is done simultaneously, it is a way to keep your space in the enrolled class while trying to enroll in a new class. For more information on how to swap a class, please view the video tutorial or read the step-by-step instructions. Question: Where can I get help with LionPATH? Answer: The LionPATH launch page links to many helpful video tutorials that take you step-by-step through LionPATH. This page also contains useful links to University information and important announcements regarding LionPATH. In addition, if you are experiencing an issue with the LionPATH system, you can contact the LionPATH team at lionpathhelp@psu.edu or submit a service request, and the appropriate person will get back with you.